There is a place and a function for everything. While litter boxes function as feline restrooms, sofas and beds are supposed to be for relaxing, sleeping and (if we’re lucky) cuddling cats. We expect to find cat urine in the litter boxes, not where we unwind and nap. But what about a cat peeing on the bed or couch? A cat peeing on the bed or couch isn’t purposely being naughty, nor is she seeking revenge. Cats urinating in the wrong places should never be punished — there are legitimate reasons for this behavior problem. A cat peeing on the bed sends a message to everyone in the household that there’s a problem that needs immediate attention. 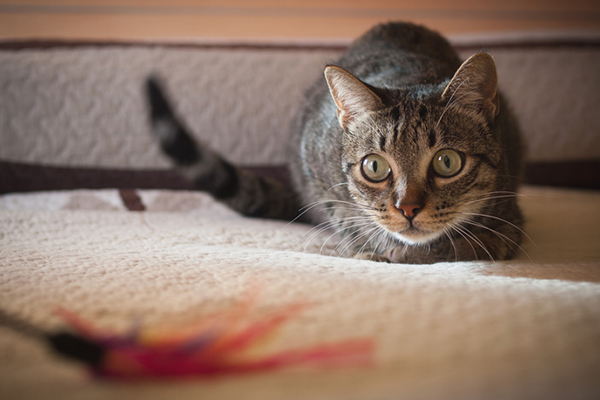 So if you’ve ever wondered, “Why is my cat peeing on the bed?” or, “Why is my cat peeing on the couch?” we’ve found a few reasons and ways to help you alleviate the issues! 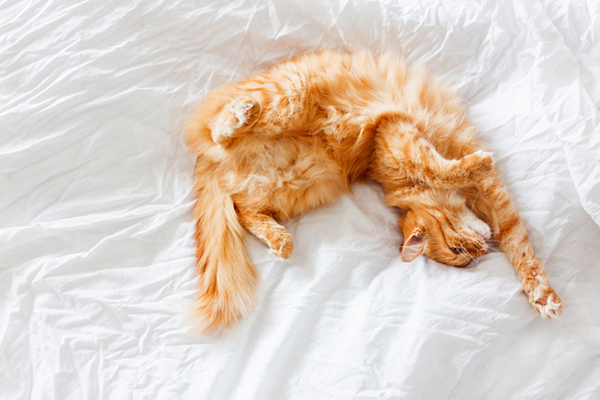 A cat peeing on the bed may have medical issues. Photo by Africa Studio / Shutterstock. Whenever your cat has a behavior challenge or exhibits a change in behavior, have her examined as soon as possible by a veterinarian. There are no exceptions to this rule, and this includes a cat peeing on the bed. 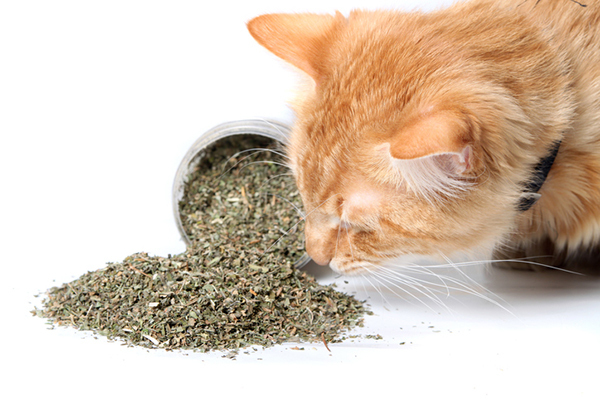 Many serious medical problems can cause cats to avoid using litter boxes. A short list includes urinary tract infections, diabetes and arthritis, as well as a host of other painful and serious conditions. Elevated places, like beds, feel safer to cats. Photography ©Aksenovko | Thinkstock. What do sofas, beds, chairs and counters have in common? They have surfaces that are higher than the floor and have good views. The elevation is perfect for kitties to identify and escape potential threats and stressors. Survival is a priority — it’s instinctual, cats naturally don’t want to be ambushed. Sometimes, your cat peeing on the bed or the couch is telling you that these places feel safer than his litter box. It’s harder for other animals to corner and trap cats on elevated areas because the perpetrators are easily seen. Some cats don’t like enclosed litter boxes. Photography ©amstockphoto | Thinkstock. Sometimes, a cat peeing on the bed or couch is the cat parent’s fault. The cats just don’t feel safe using their litter boxes. From the feline point of view, the locations and types of boxes can be setups for other animals to corner and possibly trap them. 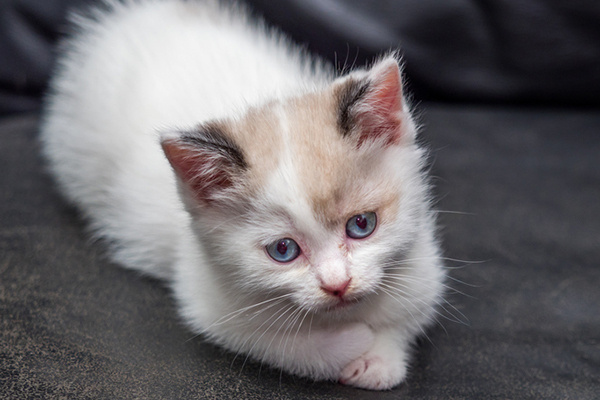 Depending on the stressors, people can help their kitties feel more secure as well as stop or prevent unwelcome behaviors like a cat peeing on the bed or couch by making a few simple changes to the litter boxes. Cats need choices — if one litter box doesn’t feel right, there needs to be others located throughout the home. The litter box rule is one per cat and one for the household. If you have three cats, then your special felines need four litter boxes. The locations will make the difference between usage and avoidance. Place them in areas with good views where it would be challenging for other household animals to trap them. Avoid places such as closets, cabinets and small rooms. The box itself makes a difference as well. Litter boxes need to be uncovered. Kitties can be trapped and ambushed in covered litter boxes. Other faux pas that can cause cats to avoid their boxes include providing them with litter boxes that are too small and not cleaning the litter boxes regularly. Vertical territory helps cats feel safe. Photography © marima-design | Thinkstock. Mild as well as serious disputes with the other resident animals can cause issues like a cat peeing on the bed, couch or other inappropriate places. Cat fights often occur over status, territory and resources, and can occur when other animals are introduced too quickly into the household. Dogs can be a source of stress as well — some are serious threats, others chase or play too rough. The end result is often the same — a cat peeing on the bed, couch or other areas with good views that she can quickly vacate. The situation needs to be evaluated — new cats should be separated and reintroduced gradually to the other resident animals. 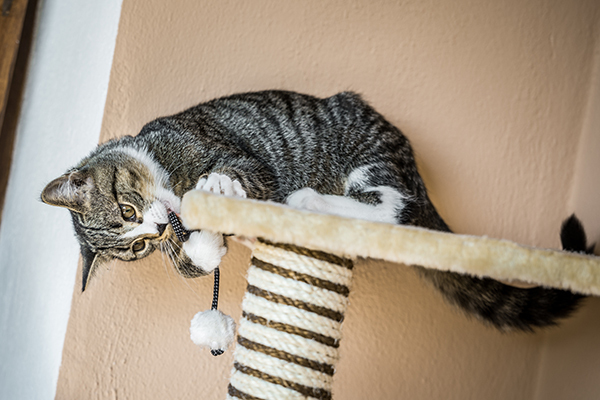 Most likely you will have to add more vertical territory — cat trees, shelves and other tall pieces of furniture that the cats can use. One way kitties show their status is by where they sit in relationship to each other. These high places are also refuges from dogs and other threats. They should be at least five feet high. In addition to vertical territory, add scratching posts and horizontal scratchers. One way cats mark their territory is by scratching. 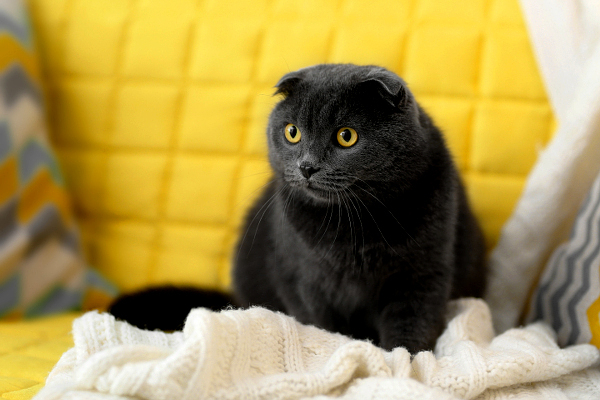 Separation anxiety can cause cats to pee on inappropriate objects like beds or couches. Photography ©skyblue16 | Thinkstock. Kitties are not socially solitary — they often form close attachments with people and other animals. Sensitive kitties can become anxious when their favorite person is away from them for an extended period of time. 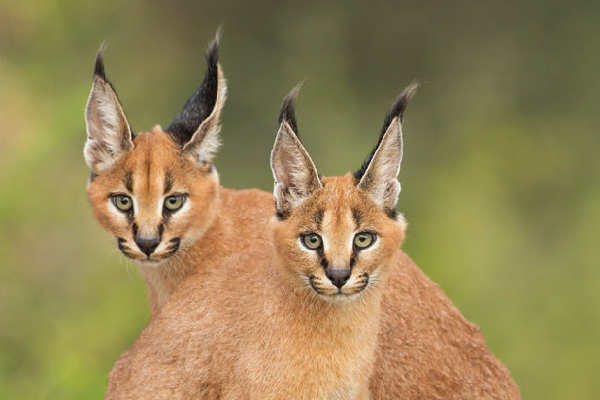 These cats might respond to the absence by peeing on the bed or the couch that is saturated with their human’s scent. They’re mingling their own scents with that of their beloved. Although separation anxiety can be heartbreaking, there are steps you can take that will help your cat feel more secure when left alone. These include enlisting someone to either stay with your cat or visit at least twice a day. During their visits they should interact with her, doing activities she enjoys, such as play and maybe grooming. 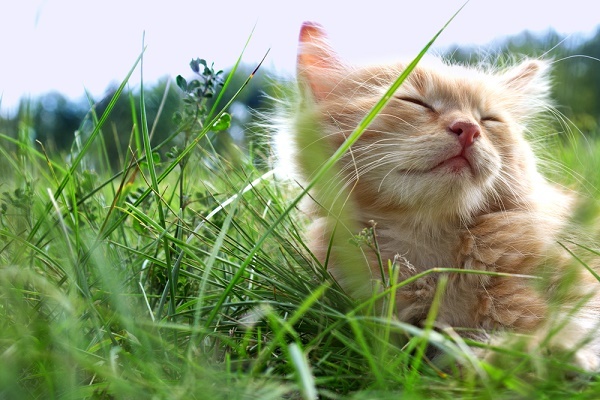 Your scent can help your kitty feel like she hasn’t been abandoned. Before leaving, place small towels and other articles of clothing that have your scent on them in sealable plastic bags — one for each day you’ll be away. Your cat sitter needs to put one new scented item out every day for your cat. With a cat peeing on the bed or other similar surfaces, the cat is sending a clear message that there is a potentially serious problem. Although frustrating, never punish the cat for the behavior. Instead, identify the reasons for the behavior and address them. If you can’t resolve the problem, then get help from a qualified expert certified in behavior. Thumbnail: Photography Rommel Canlas / Shutterstock. If you suspect a behavioral problem, always rule out any possible medical issues that may be causing the behavior by first having your cat examined by a veterinarian. She is also an award winning author. Her book Naughty No More! focuses on solving cat behavior problems through clicker training and other positive reinforcement methods. Marilyn is big on education—she feels it is important for cat parents to know the reasons behind their cat’s behaviors. Fortunately my Cat has never urinated on my bed but he has sprayed in the house! Would you recommend any guide to follow to stop this behavior? Have you or any other Cat parent tried this or heard about it? Would love to know your opinion about this! My kitty Romeo is about 3.5 years old and he’s neutered. The last 6 month or so he’s been urinating on things and it’s beginning to get much worse. We have numerous factors that may be playing a role in this situation, so I really dont know what to do. First, he was an only cat with a large older dog until my boyfriend and I moved in together. I’m not certain that he knew he was a cat. Secondly, my boyfriend has two spayed female cats. One of which is the boss of the house, very alpha if I must say. She doesn’t even always get along with her “sister”. Other factors that could potentially be something are that my boyfriend left to work in another country in late June and shortly after my older children wanted to move with their other family for a while to experience California and see other family members. Aside from myself, my daughter that moved was his other person. Initially, I was thinking it was because of the other cat, the alpha female, because he would pee on her boxes, and they didn’t always see eye to eye per se or possibly that my middle daughter wasn’t here. However, his more recent actions make me question this. He is peeing on one of our couches. I’ve tried steam cleaning it and he just turns right around and does it again. Most recently he began to pee on my bed, particularly in MY SPOT, or on freshly washed linen for my bed that hasn’t been folded or put on the bed. I need to note that my friend and her boyfriend visited and stayed for a bit and left and now my mom and her husband and small dog are here for the time being. Her little dog and Romeo play, chase each other, and I guess occasionally get a little rough. They are literally the same size. I’m to a point that I don’t know what to do! He is the most loving and sweet cat you will ever meet and other than clawing at carpet when he wants in a room or wanting to run and be feral when you open a door, the peeing is all that he really does wrong. I love him and absolutely do not want to get rid of him, but I can’t take the urine smell and I’m always cleaning something up at this point. I’m just frustrated and tired. Please someone help me get to the bottom of his misbehavior!!! so me and my roommate have this cat and we had him for at least a year or two now. we took him in from another person who was having issues with him. he was peeing and marking in their house due to other cats and a dog that it didnt like. well hes been doing fine and when we moved to a bigger apartment he did pee a couple times on things but stopped. he was doing good till last year in Dec. he started to pee on our beanbag in the living room when my boyfriend moved in. we didnt know it was going on till I moved some of his clean clothes i washed and have been sitting on the bean bag for a few days and smell cat pee on them and they were wet. I had to take the cover off and wash it so far 2 times now. the thing is hes NEVER done this before. he doesnt pee on the beds and other items.. just the darn bean bag. he does have issues like UTI or so but feed him food that helps a bit with it. I think I might knlw a few issues with this but im not sure… he might sense my boyfriend doesnt like him in a way maybe? or I might change up his litter box to see. hes using a Tote Box that has a hole on top so I migjt try a lower one maybe. Having same problem. My kitty has got kidney failure – ( very early stages) and is on special food to help with that too. Nevertheless although two litter trays in the house and kept as clean as possible – nope! – from time to time he is having a pee under the front door – same spot each time. Very annoying. We found a tiny, malnourished 5-6 week old kitten a few weeks ago. We started feeding her and loving her right away. She was so desperate for love and care. At first we weren’t sure if she was littler trained at all. She wanted to be held and cuddled all the time. We definitely think she had/has separation anxiety. She is doing better now, but still pees and poops on our bed (while we are in it!) and on the sofa. At first I was really surprised becasue I thought cats didn’t like to go potty where they sleep, and we’ve been letting her sleep on our bed with us and on the sofa. We made sure her little box is big enough, has no lining or cover, and put fresh, fine litter in it. We decided to shut her in a small room for the night and when we are not home with a comfortable bed, her food, and of course the litter box hoping this will work. Her food and bed are not right next to the litter, but are close since its a small room. Did we do the right thing? She is not being punished. We just want her to feel secure and be close enough to the litter. Our room is on the opposite end of the house from her litter, so we thought maybe it was too far and she didn’t want to leave us to use the potty. For her first few nights here, we even had the litter and food in our room, but we didn’t want that to be a long term solution. I love cats, but I don’t want litter boxes and cat smells all over my house. I grew up with cats, and we always had the boxes in the basements with no problems. Exact same thing with my kitten now, anything new/sugestions ? I have an odd question. Do you think breastmilk can trigger a male cat to pee on the couch? My cat 2.5yo spayed did pee on my couch twice in the last 2 weeks (could be worse I know) but everything started when one night I fell asleep on the couch and I leaked breastmilk, the next day the same cushion had cat pee all over it, like a lot including a pillow that was there (I threw the pillow away and kept the cover). I washed everything… 2 weeks after he pees again, including the same pillow cover. He doesnt seem to have a problem with baby stuff he sleeps on it all the time (bouncing chair, his nursery). Watching our camera I also notice that this “Accindents” happened the same time around 8:30 am, I thought this was odd. My baby is 2 months old, is possible he is feeling it just now? Congrats on the new baby and sorry you’re experiencing this! We suggest asking a vet or behaviorist about this specific issue. Has anyone experienced their cat peeing in the sink? I’ve heard of toilet training but this is something else. She follows me into the bathroom all the time (she’s a baby we rescued as a foster at 4 weeks old) now that she can jump high enough she hops into the sink while I’m going and looks pretty proud of herself at the time. She uses both bathroom sinks, including the one next to her litter box. we can tell because of the telltale golden ring around the drain, that she does this relatively often. It’s easy to clean up and nothing compared to the revenge pooping my older cat used to leave for me when she was mad but still curious. Speaking of revenge pooping, The worst with my old cat was the time I was out of town for two weeks and she climbed under the sheets to poop on my side of the bed. My ex never noticed (ugh) until I came home and found it. Yes my oldest female cat use to pee in my sink only mine the problem was a male foster cat was not letting her use the litter box he was also stalking her. I found him a home where he was the only cat and my problem went away. She may not like the litter you are using either I have seen this happen to others. Something they did not say in this article is the type of litter you are using or a dirty litter box. You read this article and you’re still talking about “revenge pooing”? My small Tonk pees in the sink while I am also peeing. I think that she knows that the bathroom is the place for such activities. This is good. My cat came & urinated on the bed, while I was in it. After a visit to the vet, he was diagnosed with diabetes. I think that was his way of letting me know that he was sick, because he always used the litter box and had never peed anywhere else. With treatment, he is getting better. But, peeing on my (really it’s ours) bed, is telling me that it’s time for a vet visit. I have one foster cat that has started peeing on my comforter. I’ve fostered her for 2 years. I have lots of litter boxes, even a Litter Robot (self-cleaning). She likes the other cats, snuggles with them at night. My question is, should we hide one or two litterboxes behind things so that the other cats don’t watch each other? I rescued a 3 1/2 yo black domesticated neutered male cat 9 months ago He peed on my bed 3x the during second week. I got the comfort cat infuser and spray after the vet r/o UTI. All of a sudden he started peeing on my couch first thing in the morning the past 3 mornings when his bladder is full. He also uses the litter box. I also have a dog, but she doesn’t bother him at all. Actually the cat sniffs the dogs’ head and lays next to her. The dog doesn’t react. I cleaned the cushions thoroughly and they are still drying for 1 1/2 days. Is this a behavior problem? This is my first cat and I’m am discouraged. I don’t want to rehome him. Please advise!!!!! A cat’s logic is, unless they recieve negative attention due to an activity it is okay to do. Therefore, by not giving the cat a negative stimulus related to the activity, aren”t you telling the cat that it is okay to do?? Doesn’t work that way with cats. later they are 100% happy and purring. pee right in front of me, no anxiety issue there. My kitty was fine until we moved. Then her behaviors started. Walking and growling in the new place, creeping. Acting confused and agitated. I don’t know why. Then I found urine on the sofa, large amounts not just piddles. I started crating her inside the house because she kept creeping into my bedroom. I uncrated her and the peeing continued to the point I was afraid I’d have to get rid of the sofa. Right now she is crated. I hate it, but I don’t know what else to do. Her litte box is clean, she has water, nothing has changed except her environment which for me was a good move, but she is not adjusting. This was a really, really interesting read. I moved abroad in 2013, and due to where I was going, I couldn’t bring my cat with me. She stayed with my mother and sister, and the entire 9 months I was gone (it was awful, I missed my cat so much) she started urinating strange places – the bed, the couch, on my sister’s paperwork on her desk. Reading specifically about the separation anxiety and the safe aspects of urinating up somewhere high really hit home for me. I was eventually able to move somewhere that I could bring her, we both moved to Europe and are the happiest we’ve ever been (and she very rarely pees outside the litter box now!). It makes me sad to think that she was having anxiety or not feeling safe being away from me – but I’m happy we’re happy now and she doesn’t have these issues anymore. Thank you for the really insightful look into why she was doing this.